Every September we celebrate National Assisted Living Week. This year’s theme is “Capture the Moment.” What a perfect sentiment for our residents who teach us each day “the art of being present” and living in the moment. When luck has it, we, the staff, manage to capture certain moments on camera at just the right time. 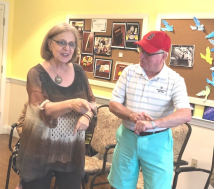 Below are a few moments from our Executive Director, Maria Scaros’ drama therapy group. Maria has been a Drama Therapist for 35 years, and twice a month, residents experience the feelings of the “here and now” as they engage in storytelling and imagination. 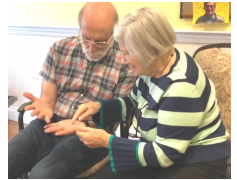 Residents began the group by exploring their hands as a testament to all they have accomplished in life; hands that have embraced their children, gardened, changed a tire, and for some, held a weapon in war. They also shared poignant moments with their friends, sometimes holding hands as part of the dialogue. Bringing the group into the present moment through role play and other theatrical techniques, Maria guided them in an engaging “here and now” where each resident shared feelings, made physical contact and validated the roles they’ve lived within a playful environment.